If you’re familiar with Rideau Vineyard, you’re familiar with the quality and attention to detail that we put into our premiere, small-lot wines, as well as the the warm and inviting experience of our tasting room and estate. What you may be unfamiliar with, however, is the new look and feel of the brand itself: our logo, our labels, our tasting room, and our new website. What we hear time and time again is that the full experience of Rideau wines is best had at the tasting room. The vast majority of our guests and Cellar Club members visiting us in the Santa Ynez Valley make Rideau a destination in and of itself: whiling away an afternoon under the canopy of flowers on our patio, enjoying a glass of our Rhône-style wines while catching up with a friend, playing frisbee on our lawn with your family (of both the human and canine variety! ), or enjoying the sounds of guests playing the piano on our patio. Our primary goal with our rebrand was to represent these magical, intangible experiences across all aspects of our wine: tasting room, website, and of course, the wines themselves. 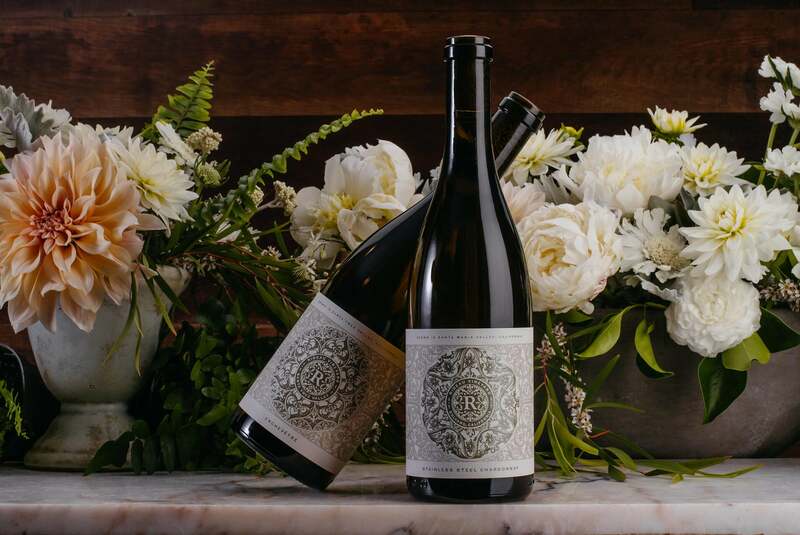 Our Estate, Locally Grown, and Reserve wines all received a label refresh inspired by the beautiful flowers that envelop our patio as well as the iconic wrought iron balconies of New Orleans, our founder Iris Rideau’s historic hometown. At the center of each label is the new Rideau logo, encircled by a unique design for each wine, reflecting its distinct personality. Whether you’re enjoying our wine with us at the tasting room or at home with a special dinner, these labels are intended to bring to mind the incomparable experience of enjoying the wine at our estate. Our Adobe Series is an exploration into non-Rhône varietals and winemaking practices—a Rideau tradition. These small production, limited release wines are crafted to be distinct, remarkable, and lively, just like the characters from the storied past of the historic El Alamo Pintado Adobe, now the home of our estate’s tasting room. Each wine in our whimsical Adobe Series represents a real character who at one time either owned or otherwise influenced the Adobe and the bountiful land surrounding it. We certainly feel the magic that exists on our estate, and we are often told that the most incredible part of the Rideau experience is that it inspires a sense of being in your very own secret garden, something enchanted and unexpected, unseen from the main road and exempt from the normality of day to day life. The new look and feel of Rideau Vineyard is inspired by that feeling and intended to help you conjure it wherever you may be.